Carissa is one of the 6 founding members of KADP, and is a highly active volunteer who helps educate not only the Texas community, but the entire world on the injustices of the Death Penalty. In the interview portion of today’s contest Carissa spoke about her aspirations to become a senator, and her desire to abolish the “law of parties”, and the death penalty as a whole. Today’s Girl Contestants are judged not only on a variety of skills but beauty as well. Carissa dominated the competition, taking home several awards! 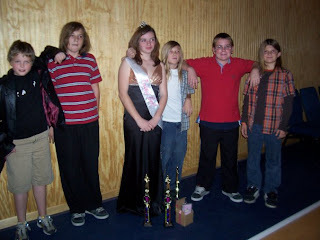 She was crowned Overall winner for her division and now holds the title of ‘Today’s Girl 2009 Lampasas Teen’. In addition she won the following categories: ‘Most Beautiful’, ‘Most Photogenic’, and ‘Best Casual Wear’. Carissa will be attending the state competition in Dallas Texas in June 2009. If you’d like to know more about KADP’s anti-death penalty movement, please visit their website @ http://www.freewebs.com/kadp .